Young, Hip and Conservative: a skeptical blog: Do video games have a liberal bias? "A garden world with heavy populations of humans and batarians [an alien race], Anhur was home to one of the ugliest violations of sapient rights in modern human history. A consortium of corporations and corrupt politicians, fearing batarian economic competition due to their custom of legal slavery, passed a resolution that abolished the minimum wage - effectively relegalizing slavery on a human-dominated world." I understand that when an artist creates a world, that world runs exactly the way the artist believes it would. In American Beauty, a gay basher is secretly gay. The 18th century painting The Bostonians Paying the Excise-Man shows ugly, cruel Americans abusing a British customs official. Likewise, the Mass Effect universe is filled with evil corporations. In the first Mass Effect game, every time you encounter a corporate researcher, they are covering up some unethical experiment. The planet Noveria is populated with scrupulousness corporate laboratories performing illegal experiments where the government can't see and the mission to planet Feros reveals a corporation is running an evil experiment on their own colonists. You can't bump into a single private company in this universe without finding a closet full of skeletons. No opportunity to wallow in the inhumanity of capitalism was skipped. "Sea levels have risen two meters in the last 200 years, and violent weather is common due to environmental damage inflicted during the late 21st century." I will give the Mass Effect writers credit for the capitalist character Ratch, who demonstrating the Beckerian idea that merchants are harmed if they act on racial prejudices. Ratch is the only character who is kind to you on a hostile world, simply because he wants you to buy from his store. 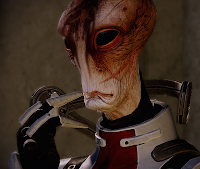 Don't get me wrong, I love the Mass Effect games and I plan to keep playing them. I just have to tolerate a lot of eye rolling, such as when the privatized space prison is lead by a brutal, corrupt warden. I feel comfortable concluding that this individual game has a liberal bias, but what about the stories of most video games? Most video games are politically neutral - Tetris had nothing to say about the abortion debate and Mario only weighed in on the death penalty when it dealt with marauding turtles. I freely admit that I don't have a study, my sample size is limited to the games I encounter and all my observations are vulnerable to recall bias. Despite these limitations, I feel it's reasonable to believe video games have a liberal slant when they do introduce politics. Other examples include the opening scene to Mirror's Edge and the corrupt right-wing Enclave in Fallout 3. "In old America, the America I fell in love with, we dealt with stupid people very discreetly, OK? Now, now I don't know if it's - if it's something in the water, or - or the lack of separate water fountains, uh, but it's like a plague has taken over." "What we've been given from our forefathers - the freedom from thought. That, for my money, is real freedom. Knowing you're always right - that's real freedom!" These parodies of conservatives are pretty harsh. Bastion calls the ideal conservative world a "limited-access paradise." These writers were not kind to the right. "I play to win, if you don't play to win, you play to lose - like a liberal." Grand Theft Auto is hard on conservatives because it's hard on everyone. The jokes can be pretty harsh, but the writers made sure to give everyone a healthy dose of ridicule. As for the claim from Mass Effect 2 that eliminating the minimum wage is an evil act akin to slavery, economic science doesn't agree. Most economists believe that one consequence of the minimum wage is an increase in unemployment. There was a contrary study released in 1994 by David Card and Alan Krueger that got a lot of attention, but it was criticized for using a small sample size and unreliable data collection. The basic argument is that unskilled workers are shut out of employment because it's not worth hiring them at a high wage. If there is a $10 minimum hourly wage, a teenager with little experience or skill who is expected to only produce $9 of value an hour will not be hired. Thus, most economists argue that minimum wages hurt the people they are supposed to help. I don't mean say this ends the minimum wage debate. Card and Krueger's study was approved by people like Paul Krugman, and as a result the opposition to minimum wages from economists no longer enjoys an overwhelming majority. The general public, however, doesn't seem to know very much about this issue, and the simplistic story the writers of Mass Effect presented is painfully ignorant. Update: Visitors to the city of Nos Astra in Mass Effect 2 are cautioned not to sign anything because the city has "free trade." They clearly mean "a free market" because the city is awash in drugs, slavery, prostitution, and greed - but no word on punitive tariffs or trade barriers. Interesting article but I think you are a bit too harsh on Mass Effect's evil corporations. There are plenty of corporations you don't hear anything about, but the ones Shepard does encounter happen to be corrupt. I don't think it's necessarily a blanket argument that in the Mass Effect universe all corporations are corrupt. I think the writers actually tend to balance things. For example, for every selfish politician like Udina you have a Captain Anderson. Still, you do raise some good points but I feel like Mass Effect isn't as slanted as you imply. The Council, if anything, is a major slam against the liberal wait and see attitude and their reluctance to get involved in anything nearly destroys the galaxy...twice. There are also some interesting decisions you can make in some quests where the game doesn't preech, it simply lets you decide (like the Racchni Queen, and quite a few quests in 2). This might very well be the case, but why is an increase in unemployment bad? There are never going to be an exactly even number of jobs vs. able-bodied workers. It is thus one of the jobs of the government to aid those unemployed who are actively seeking employment until they do find work. I went through the Mass Effect wiki to find the list of all the corporations in the first game. Here's what I came up with. There may be more as it's poorly organized. Binary Helix was breeding the dangerous rachni, which almost destroyed the universe last time. Conatix Industries performed ghastly experiments on humans. Elanus Risk Control Services and Synthetic Insights, Ltd have labs on Noveria to perform illegal experiments. ExoGeni experimented on unsuspecting people in atleast two missions, and covered up the deaths of it's researchers in a third. Nashan Stellar Dynamics executives were found giving kickbacks to politicians. The only positive detail of a corporation is the Sirta Foundation, which uses some of its profits to fighting genetic diseases. While I agree that the Citadel Council shows the dangers of red tape, it does not have corruption scandals, unlike the United Nations. The solution it gives the consumer is to entrust massive power to agents - such as the main character Commander Shepard. Yes, it also shows the folly when another agent is corrupted, but it implies the problem wasn't entrusting that much power in a single person - but simply giving it to the wrong person. Jen, this isn't the best place to debate the minimum wage. Your answer sounds like you're not familiar with the arguments of both sides of the issue.